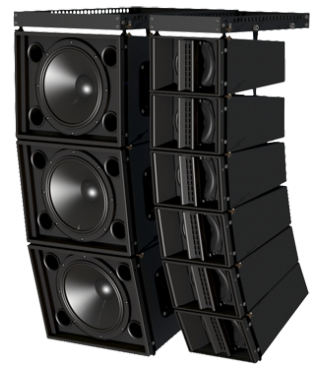 The modular MA series loudspeakers from Ambisonic Sound Technologies will allow a sound system designer to deliver true line-array performance in an articulating arrangement, according to the company. The MA series consists of modular articulating line-array loudspeakers that use true coaxially aligned midrange and PMRD tweeter drivers to create pro audiophile performance in a flexible, modular option. The series includes the MA1600 compact line-array module and the MA1216, a high-impact, high-efficiency subwoofer, to produce a full-range solution for professional installations and live events. The MA1600 Compact Line Array Module utilizes the company’s Planar Magnetic Ribbon Design (PMRD) drivers and a high-power 6.5-inch custom, neodymium-magnet driven, Kevlar/paper mid-woofer. The true coaxial configuration of these drivers, along with their unique Waveguides, creates a wide, 110-degree horizontal coverage. The ability to install a line array, with a recommended minimum of four boxes that can be articulated from 0 to 8 degrees in 1-degree increments, improves front-to-back audience coverage to within +/- 2dB. The companion MA1216 compact subwoofer module’s long-excursion driver and dual-layered voice coil extends low frequencies down to 34Hz. Up to 24 line-array modules or 12 subwoofer modules can be flown in a single hang using the integrated rigging, while still providing a seven-to-one safety factor.Ambisonic Sound Technology offers the MA1216 Subwoofer to match and complement the low frequencies of the modular line array loudspeaker. The single, long-excursion, high-powered 12-inch driver provides plenty of output from the bass reflex enclosure and includes a dual-layered 4-inch voice coil. The 1216 can be flown with the MA1600 and articulated to match. Up to 12 modules can be flown in a single hang with an ability to create either an in-fire array or a cardioid pattern. These speakers will be available in black or white enclosures. Pricing and specific availability have not yet been announced.